Lviv-Debrecen train trip: how much will it cost? I can see the price for the Lviv-Chop segment on the Ukrainian Railways website (UAH51, or about $2), and I can see the other segments on the Hungarian Railways website, but not their prices. Is there a way to view the tickets' prices online? How much will the journey cost, roughly? The ticket from Chop to Záhony (for the border crossing) can't be bought online, but you can buy one at the train station in Chop. The last price information I could find is a few years old, but it used to cost about UAH 39 (appr USD 1.50). 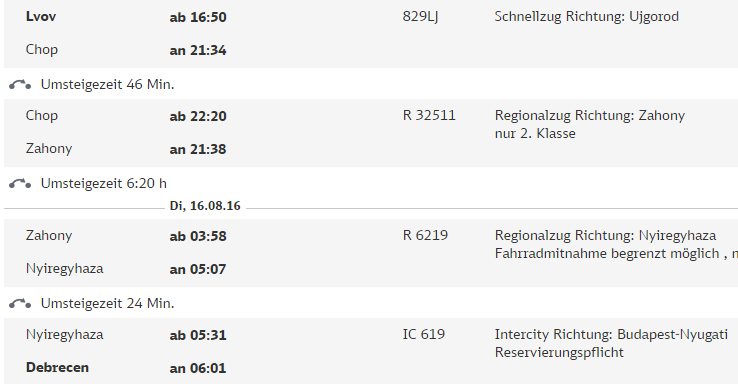 The ticket for your connection from Záhony to Debrecen is HUF 2,350 or about USD 8.50. You can buy it up to two months in advance from MÁV's web page. Not the answer you're looking for? Browse other questions tagged trains tickets price ukraine hungary or ask your own question.